The days are cold and crisp. Ponds have frozen solid and smooth. Guess who'll be receiving skates for Christmas? 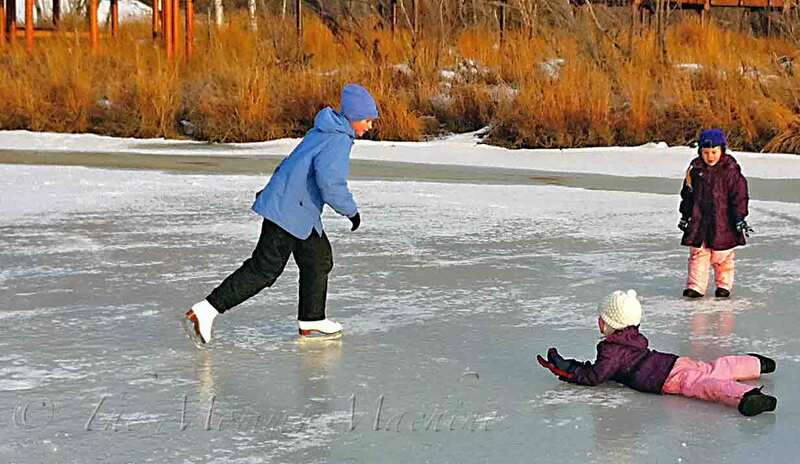 Until then, the twins are happy to shuffle across the ice in their boots. Looks beautiful and fun to me. Love the pictures. It looks like they had a ton of fun! how cute! When is the right age to introduce ice skating? Do I have to wait another 2 years? Skating on a pond is one of those things I would love to do. But I'm always too chicken. Just what if that pond isn't quite as frozen as I think it is? Although, in Alaska, I'm pretty sure you're safe. Norman Rockwell couldn't have painted a better picture of winter than that second one!